Gas analyzers are designed for continuous, automatic monitoring of mass concentration of one of the hazardous substances: carbon monoxide (CO), hydrogen sulfide (H2S), sulfur dioxide (SO2), hydrogen chloride (HCl), chlorine (Cl2), nitrogen dioxide (NO2), ammonia (NH3), amyl (АТ, nitrogen tetroxide N2O4), odorant (RSH), nitrogen oxide (NO) and oxygen volume fraction (O2), in the air of working area and in the process media that contain hydrocarbons. Application – monitoring of air conditions of working area of chemical, petrochemical and refining manufactures, other industries. For application in the conditions of the Extreme North and the Arctic. Principle of operation – electrochemical. Material of enclosure - carbon-filled polyamide / aluminum / stainless steel. 03. 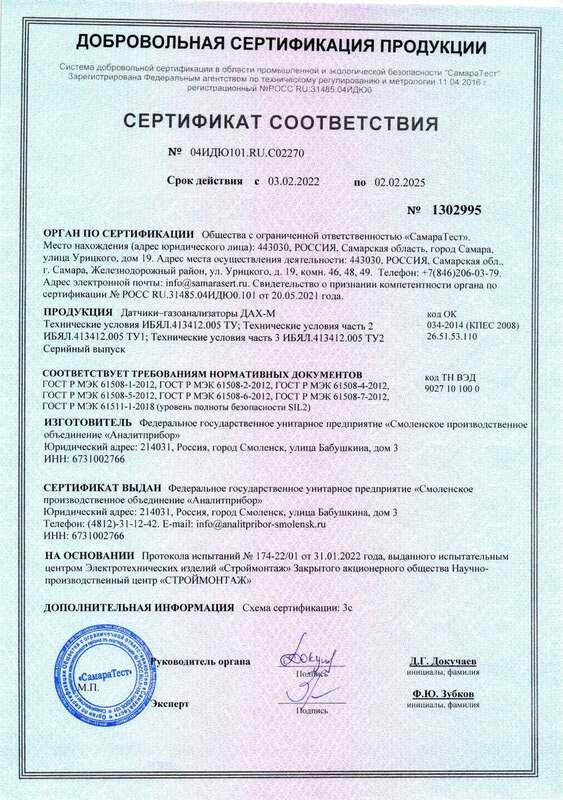 Indication range of gas analyzers ДАХ-М-05-NO2-10 on digital display and digital communication channel – from 0 to 20 mg/m3. Secondary power supply and alarm units БПС-21М are used for power of gas analyzers. Gas analyzers ДАХ-М are supplied with the set of cable gland (for armored cable, metal hose, tubing) on special order.